Creative Commons image by Carol Von Canon on Flickr. There’s your sermon, Working Preachers. It’s hard to imagine a better sermon than Mary Magdalene’s on that first Easter morning. Short and memorable and to the point. Easily fits on the church sign for all to see. Sure, you may need to flesh it out a little because people expect an Easter sermon to be longer than one sentence, but not that much. We tend to preach too much on Easter Sunday, thinking that we need to say something profound, as if the empty tomb is not profound enough or can’t preach its own sermon. 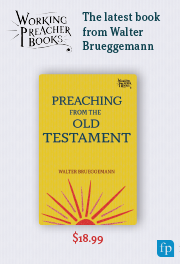 In fact, too often our preaching is too much -- too much explanation, too much justification, too much rationalization -- of the text, of our take on the text, of what God is up to in the text. Our preaching default leans toward expository rather than experiential, pedagogy rather than proclamatory, illustration rather than incarnational. And in our endless attempts to make the Bible relevant, we have forgotten that the Bible creates its own relevancy -- and this is never more true than Easter Sunday. Mary’s sermon is a homiletical gem -- and maybe the truest sermon ever preached. She doesn’t say, “Christ is risen, he is risen indeed,” but “I have seen the Lord.” Resurrection is not a third person confession but a first person testimony -- and this is all you need to preach. People don’t want to hear that the resurrection is a creed of the church -- they need to hear that the resurrection is a truth they might witness and to which they might give witness on a daily basis. They need the invitation, the encouragement, the promise that they can say, “I have seen the Lord” in their own lives. This doesn’t mean that they have to find the tallest mountain, the busiest street corner, or the jam-packed mall and yell it out for every passer-by to hear. It doesn’t mean putting John 3:16 on a poster to hold up and wave during a football game. It doesn’t mean evangelism as coercion, competition, certainty, and beating the other down. To say “I have seen the Lord” is to point out resurrection in the midst of ruin; new life when all that seems visible is death; love in the face of hate; decency and goodness when that which is vitriolic and vile and vicious finds only more and more followers. Because, in the end, resurrection is not only the promise of life after death, which, after all, would be enough, but also the assurance that the life-giving love of God will always move the stones away. Tombs are just that -- containers for the dead. And while we seem rather content these days with such spaces -- those dead places that fuel corruption, deception, racism, sexism, suspicion, rejection, marginalization, misogyny, judgment, and fear -- God continues to roll those stones away that keep life at bay. And when the stale air of decay meets God’s breath that creates new life and the possibility of hope and peace, death truly is no more. The promise of the resurrection is not only secure because God made it so by raising Jesus from the dead. The promise of the resurrection is certain when we speak into our own lives “I have seen the Lord!” -- words which roll back the stones that confine and constrain in order that all life might be free to know dignity and regard and respect. Not that the truth of the resurrection needs our action for verification. Not that the truth of the resurrection depends on our witness to convince others. Not that the truth of the resurrection relies on our willingness to speak words of life into conversations intent on destruction or our determination to free those captive to the deaths that our culture, our world, perpetuate. The truth of the resurrection is true regardless of our testimony. But maybe, it will be more true for each and every one of us if we can walk out of church on Easter morning and be willing to say “I have seen the Lord,” be willing to look for where we can say, “I have seen the Lord” in your life, or imagine those who might need us to say, “I have seen the Lord” because they cannot. And why can’t they? Because they have known the walls of their tombs too long. True resurrection is the truth that the resurrection of Jesus indeed matters for our future, but even more so for our present, and for the sake of the present of others. Thank you, Mary, for preaching the sermon we need to hear and the sermon we need to preach -- every day of our lives.